Galvanised Metal Bar Panels (5cm gaps in bars). Full Roof, made from 13mm Tongue and Groove Shiplap. Dog Kennel Sizes: All Sandringhams are 1.8m to eves. The treatment described above gives wood the qualities of a long service life and long term protection from fungal and insect attack. Tanalised timber does not need any further maintenance treatment.Saving you Money and Time annually staining your dog kennel. 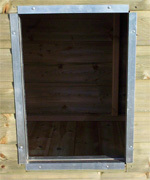 All of our dog kennels are not only delivered free of charge, but also professionally fitted at no extra cost. Leaving you secure in the fact your new dog kennel has been correctly erected and is a strong structure ready to withstand the elements. A much better option than having a pallet arrive loaded with pieces of timber and poor instructions.